This machine (and advert) is such a spectacular throw-back that it had to be included. It's the "New" British Minstrel, as produced by the oddly-named Hotel Microsystems Limited of London. It appears to be largely based on the North Star Horizon, with which it claims compatibility in a number of areas - the same Horizon that was launched back in 1977 and, whilst still available at least until 1982, was of the old-style "big box and switch" design, where video generally was an add-in card and adverts required some dimly-lit setup that had nothing to do with computers. 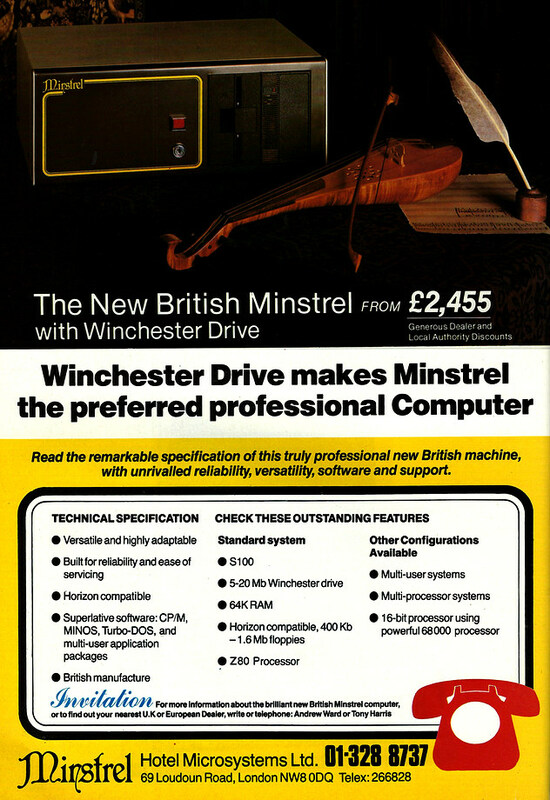 At least in the Minstrel's case, the bizarre violin has at least some relevance to the name of the computer, unlike Altos's 1978 advert for the computer-as-family-silver holder or Pearcom's 1981 oil lamp. Its retail price of £2,445 was about £8,220 in 2019. It's vaguely possible that Hotel Microsystems had been spun out of Guestel - an importer of machines like the original IBM PC - which had a specialist arm offering business microcomputer systems for hotels which was sold off in 1983.